– ANDREA TANTAROS: It’s free speech and the Obama administration is trying to shut it down. – JAY ALAN SEKULOW: The Obama administration here under Department of Homeland Security has allowed a new regime to come into place that basically says this: Our focus is going to be on the right-wing groups. – SEAN HANNITY: What do you think of that interpretation, especially coming from a guy that started his political career in the home of an unrepentant terrorist who bombed the Pentagon and capital and sat in Reverend Wright’s church for 20 years? 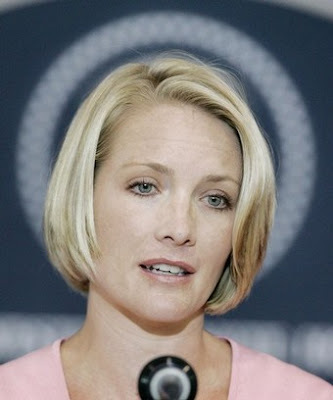 – DANA PERINO: If Bush had done that we would be having a very different conversation. It wouldn’t have taken a week to find it out. There would have been a special prosecutor. We would have had to come out and apologize. Oh, Dana Perino. You’re so pretty. And so dumb. That must be why your boss didn’t trust you enough to tell you that these reports WERE of his own doing. And Fox News has it again! HERRIDGE: Well this is an element of the story which has largely gone unreported. One looks at right-wing groups, as you mentioned. And a second is on left-wing groups. Significantly, both were requested by the Bush administration but not finished until President Bush left office. First of all, I’m awaiting Ms. Herridge’s dismissal/disavowal/retraction of her dastardly fact-based reporting. A frog sees a scorpion on the side of a river. The scorpion asks the frog for a ride to the other side, to which the frog replies, “But if I give you a ride, you’ll bite me.” The scorpion reassures the frog that that’s impossible, since then the frog would sink and they would both be doomed to watery graves. The frog concedes, puts the scorpion on its back, and starts swimming. Halfway across, the scorpion bites the frog, and they both die. Some say that you should take away from this that mutual destruction is inherent to dangerous alliances. As for me, I think the point is the following: Froggy, my friend, you knew what the scorpion’s nature was when you joined up with him. It’s a tough lesson, but still a necessary one. Teabagger: How could you spy on us? Bush, holding up a copy of the Patriot Act: You knew what I was when you picked me up. Since Thinkprogress is very much not above lying in the quest to “reshape” America, d oyou think you could provide some collaboration – say a link or objective reference to this alleged left-wing extremist report? All that’s on Thinkprogress is an antique 2001 report on Leftist radicals. Nevermind. I dug deep enough through the links to find a reference to the left-wing report. It also links to the report itself. Enjoy!